Here is our exciting and photo opportunity-filled itinerary. Keep in mind that happy opportunities also present themselves when you travel so there could be slight changes as the journey proceeds. Weather and other unforeseen events beyond our control might lead to some alterations, too. If you are registered for the workshop, we will notify you when we have reached the minimum number of participants for the workshop to go, so you can make your flight arrangements. Remember to get Travel insurance, too! Throughout the workshop you'll see "free time" listed. These blocks of time indicate that no tour guide will be with us and activities can vary according to what we need or want as our trip progresses — small group sessions, extra rest, one-on-one instruction, time to wander or shop or whatever best prepares you for the next adventure. This will be our arrival day. No matter when you arrive, you'll be met at the airport and taken to our hotel. Activities are not set for this day, however, Dan and Sarah will be available to assist you with settling in or with any early exploring. 9:00-11:00 am Morning gathering to go over the itinerary and answer your questions making sure our cameras and iPhones/iPads are ready to go. 2:00-4:00 pm A introductory afternoon with a city tour of Hanoi. Highlights include graphic railway lines and one of Hanoi's mesmerizing traffic circles with its dizzying array of cars, motorbikes and pedestrians navigating the chaotic intersection. 4:00-7:30 pm Free time to photograph, rest or wander. 8:00pm Welcome dinner at the Ly Club Restaurant. 5:15-6:30 am Early morning military raising of the flag with all the pomp and circumstance. 6:50-8:30 am Breakfast on the bus as we travel to Huu Tiep Lake. Navigating back alleys and residential streets, we'll arrive to see the wreckage of an American B-52 bomber shot down in 1972, now resting in the lake. 8:40-10:15 am We will visit the Hoa Lo Prison known as the "Hanoi Hilton," which was used as an internment facility for American POWs during the Vietnam War. It was here the North Vietnamese Army housed, tortured and interrogated captured servicemen, mostly American pilots shot down during bombing raids. Senator John McCain was held here for a portion of his 5 1/2 years in captivity. 10:25-12:00 noon Tour the Ho Chi Minh Mausoleum, his home and the surrounding building and gardens. 12:30-1:45 pm Lunch at the Le Tonkin restaurant. 5:30-7:00 pm Capturing sunset images of the Tran Quoc Pagoda. Built in 544AD, Hanoi's oldest Buddah temple, Tran Quoc Pagoda, sits nestled on the banks of Ho Tay (West) Lake. 7:00-8:30 pm Dinner on own, suggestion: Madam Yen Restaurant. 7:00- 8:30 am Optional sunrise photo walk around the lake. Many people will be strolling around the lake and doing their morning exercises. 8:30-10:00 am Breakfast and preparing to checkout from hotel. 10:00-12:00 noon: Bus travel to Got Port, Haiphong. 12:00 noon: Small boat transfer to the Maya Cruise ​with opportunity to photograph Cai Trap canal. 12:15 pm: Welcome drink aboard the Maya Cruise, orientation and check in. 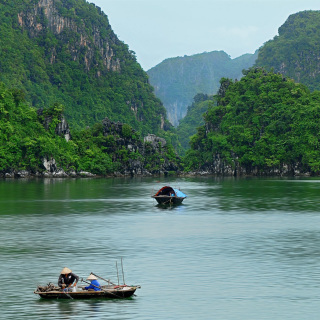 Cruise and explore Lan Ha Bay & Ha Long Bay. 12:40 pm: Maya Cruise proceeds to Da Chong islet, with its lighthouse built by the French over 100 years ago. Have lunch while viewing amazing limestone karst formations rising from the sea. 3:00 pm: We progress to Tra Bau area of Lan Hạ Bay — a separate part of Halong Bay. This is a quiet paradise in Vietnam where you can enjoy kayaking, swimming or relaxing. 5:00-7:30 pm: Cruise time offers many optional activities. Watch the magnificent sunset over the Gulf of Tonkin. Join the chef for an onboard cooking class making traditional Vietnam dishes. Enjoy the early evening Happy Hour or spend your time photographing. 7:30 pm: Dinner is served onboard with delicious local food in a unique setting. 9:30 pm: Enjoy the landscape of the bay at night up on the top deck. Relax with drinks from the bar, try your hand at night squid fishing or enjoy movie in the restaurant. Overnight on board. 06:00-8:30 am: Early morning photo session from the boat and the option to canoe in the bay near the Toi Sang cave. 9:30 am: Check-out from the Maya Cruise and enjoy brunch onboard during return trip. 12:10-2:30 pm: Return to the hotel in Hanoi. 3:00-5:00 pm: Class time and image review. 6:30-8:30 pm: Dinner on your own, suggest Green Tangerine within walking distance of hotel. 7:30-1:30 pm Travel 90 minutes to Tan Vien village, an ancient basket making and fishing village still practicing traditional rural traditions of northern Vietnam. Using skills that have changed little from feudal times, the villagers utilize unique tools to knit fishing baskets. We will photograph them making the knitted baskets and demonstrating fishing with their creations. The nearby village of Cao Thon is known for the craft of making of musk incense blended from a mixture of herbs crafting a unique fragrance that no other village can reproduce. We will travel from house to house to photograph the different ways each family produces the incense in a process handed down from generation to generation. We will also visit the Hoang Ba temple where we will see and photograph local monks. 2:00-3 pm Lunch in Pho village. 3:00-4:30 pm Return to Hanoi. 7:30-09:00 pm Dinner on own, suggest Mam Restaurant. 10:00-12:30 pm The Temple of Literature was built in 1070 and is one of several temples in Vietnam which is dedicated to Confucius, sages and scholars. The temple is composed of 5 courtyards with altars, ponds and gardens and 82 steles (upright monuments) on stone turtles. There will be time to wander around the Old Quarter or possibly take in another museum of your choice. 12:45-2:00 pm Lunch at the Koto Restaurant. 2:15-4:00 pm Visit and photograph the Nguyen Dinh Chieu School for the Blind serving disabled children ranging from 6 to 16 years old. The children will treat us to a musical performance. 6:00-7:15 pm Walk to a performance of traditional Water Puppetry (an art form unique to northern Vietnam, and a good, light-hearted introduction to its rural culture). Photograph backstage after the performance (20 mins). 7:45-9:30 pm Dinner on own, suggest Club De L’Oriental Restaurant–22 Tong Dan St.
6:30-7:00 am Breakfast and check out from hotel. 7:00-11:00 am, Travel through the province of Phu Tho to the village of Hung Lo. In the past, this area was once one of the poorest provinces in Northern Vietnam but it is now in an economic recovery. 11:00-1:00 pm, Gia Thanh village (20 min drive), known for crafting the traditional Vietnamese colonial hats. 1:20-2:20 pm Lunch at Sen Vang restaurant. 2:40-4:40 pm Photograph in Tan Duc village, the organic vegetable village near the Red River. 5:00-7:00 pm Second Class Time and Image Review. 8:30 pm Dinner on own at the hotel. .6:30-8:30 am Check out of the hotel and breakfast on the bus as we drive two hours to the Long Coc Tea Plantation. 8:30-11:30 am Photograph the amazing scenery around the tea plantation, and the women harvesting the tea. 11.30-1.30 pm Travel to Viet Tri City. 1:30-2:30 pm, Lunch at the local Sen Vang restaurant. 3:00 - 3:50 pm Drive from Viet Tri City to Noi Bai airport (Hanoi). 6:05 - 7:15 pm Fly to Hue. 8:00-8:30 pm Check in at the Moonlight hotel. 9:00 pm Dinner on your own at the airport or hotel. 8:00-12:30 am Thuy Bieu, an ancient village with a unique and special architectural features situated on the southern bank of Perfume River near Hue and Cau Ngoi Thanh Toan with its tile-roofed bridge, Thanh Toan. This rainbow-shaped bridge spans a small ditch in Thanh Thuy village and is classified as one of the rarest and highly artistic ancient bridges in Vietnam. 12:30-1:30 pm Lunch at local restaurant. 7:00-8:30 pm Dinner on your own, suggest Y Thao Restaurant. This excursion covers a large area of the wartime ‘Demilitarized Zone’, better known as the DMZ. The group will drive north to the Quang Tri province and stop at the Old Citadel of Quang Tri. Continuing on to the Vietnam War battle sites of Khe Sanh Base and en-route visit to Van Kieu, an ethnic minority village. After lunch in a local restaurant, the route leads to the Hien Luong Bridge and Ben Hai River, and the Vinh Moc Tunnels, preserved in their original form. In the late afternoon, we will return to Hue. Group 2: Hue’s Royal Tombs. 7:00-12:00 Our morning will begin with a cruise along the Perfume River to visit the Thien Mu Pagoda and a drive to the Royal Tombs of Emperor Minh Mang. Each Royal mausoleum reflects the personality of the Emperor it commemorates. The most majestic is that of Emperor Minh Mang, a staunch follower of Confucianism with many wives, concubines and a small army of children. Planned by the Emperor and built shortly after his death it’s opulent and exotic, and a good example of classic Sino-Vietnamese architecture. 7:30-9:30 pm Dinner on your own. 7:00-8:00 am Breakfast and hotel checkout. 8:00-11:30 am Visiting Chuong village known for its conical hats and Lang Co beach​, considered to be one of the most beautiful in Vietnam. We will travel through the Hai Van Pass which was of strategic importance in the history of Vietnam. The pass represented a major barrier to any land army moving between the northern and central regions of the country. Bullet-strafed fortified look outs remain as testimony to the past. 11:30-1:30 pm Lunch at Water Front restaurant. 1:30-2:00 pm Check in at hotel. 4:00-7:00 pm Photograph Hoi An Town, an ancient trading port and UNESCO Cultural World Heritage site, was a meeting point for many cultures that left their mark in the different architectural features of its wooden buildings. The original traditional street pattern still exists, as does the quay that once welcomed ships from all over East Asia and beyond. Many remained there for months at a time, waiting for favorable trade winds to carry them home. 7:00-8:30 pm Dinner on your own, suggest Mango Mango Restaurant. 5:30-7:00 am Optional sunrise shoot by the beach. 8:00-10:30 am Short 30 min. drive to photograph the Thu Bon estuary of the Cua Dai Sea and on to Tra Que vegetable village. Along the way, we'll photograph rice paddy fields, water buffalos, bamboo bridges and local farmers at work. 10:30-11:45 am Drive to the fishing village of Cam Thanh to photograph the rural countryside including farms raising water buffalo and ducks and vegetable gardens. Also, there will be an active bird population in the Water Coconut Palm Forest. Local people will demonstrate traditional bamboo handicrafts. 11:45 – 12:45 pm Lunch at local village restaurant by the river. 1:00-2:30 pm Walk to the harbor and ride on traditional “Thung Chai” basket boats on the Thu Bon estuary through the water palm coconut canals. 2:30-3:00 pm Return to hotel. 5:00-7:00 pm Third Class Time and Image Review. 7:30-9-00 pm Dinner on your own, suggest Vy’s Market Restaurant. .7:00-8:30 am Breakfast and check out of hotel. 8:30-9:30 am Arrive at Danang airport for flight to Hanoi. 10:35-11:50 am Fly to Hanoi. 12:20-1:20 pm Drive to your hotel in Hanoi. 1:30-2:30 pm Lunch on your own, suggest Madam Yen Restaurant (near the hotel). 2:30-3:30 pm Dan to collect everyone's images for slide show. 6:30-8:00 pm Farewell dinner at the Home Restaurant with a slide show presentation of our Vietnam photography work made throughout this spectacular two week adventure. 7:00-8:30AM Breakfast and check out of hotel and travel to Noi Bai airport for flight home. March 26-April 8, 2019 — This deposit reserves your place in this 15 day/14 night photo excursion in Vietnam with Dan BurkholderandSarah McGarghan. The full cost of the trip is $4870. Full payment is due January 7, 2019. Click here for the full trip itinerary. If you have questions about the trip, use this form to contact us. We'll be able to get you the specific info that you need to join us on this epic adventure! Please send more info about the 2019 Vietnam trip with Dan and Sarah.